Credit: Ryan Strother / NYSG. 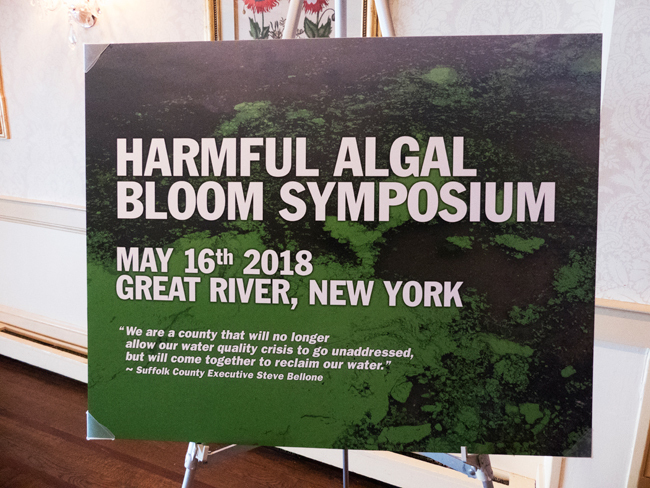 The inaugural Harmful Algal Bloom Symposium was held on May 16, 2018 at the Timber Point Country Club, Great River. The NOAA National Centers for Coastal Ocean Science provided funding for the Symposium through an Ecology and Oceanography of HABs (ECOHAB) award to Dr. Christopher Gobler, a researcher and faculty member at the Stony Brook University School of Marine and Atmospheric Science (SoMAS). Please email questions and comments about the Suffolk County Harmful Algal Bloom Action Plan to michael.jensen@suffolkcountyny.gov. Funding for this project is under NOAA ECOHAB Award #NA17-NOS-4780201. New York Sea Grant (NYSG), a cooperative program of Cornell University and the State University of New York (SUNY), is one of 33 university-based programs under the National Oceanic and Atmospheric Administration’s National Sea Grant College Program. Since 1971, NYSG has represented a statewide network of integrated research, education and extension services promoting coastal community economic vitality, environmental sustainability and citizen awareness and understanding about the State’s marine and Great Lakes resources. Through NYSG’s efforts, the combined talents of university scientists and extension specialists help develop and transfer science-based information to many coastal user groups—businesses and industries, federal, state and local government decision-makers and agency managers, educators, the media and the interested public. The program maintains Great Lakes offices at Cornell University, SUNY Buffalo, SUNY Oswego and the Wayne County Cooperative Extension office in Newark. In the State's marine waters, NYSG has offices at Stony Brook University in Long Island, Brooklyn College and Cornell Cooperative Extension in NYC and Kingston in the Hudson Valley. For updates on Sea Grant activities: www.nyseagrant.org has RSS, Facebook, Twitter, and YouTube links. NYSG offers a free e-list sign up via www.nyseagrant.org/nycoastlines for its flagship publication, NY Coastlines/Currents, which is published quarterly. Our program also produces an occasional e-newsletter,"NOAA Sea Grant's Social Media Review," via its blog, www.nyseagrant.org/blog.